Madarosis is derived from the ancient Greek word "madaros" meaning "bald" and is defined as hair loss of the eyebrows (superciliary madarosis) or loss of eyelashes (ciliary madarosis). Loss of eyelashes is also known as milphosis. In addition to the obvious cosmetic blemish for which the patient usually presents to dermatologists or ophthalmologists, madarosis may be the presenting sign of many systemic diseases and warrants detailed systemic examination and in some cases, consultation with an internist or endocrinologist for further management. This article focuses on the various causes of madarosis. a)	Infections : Infection due to Staphylococcus aureus results in thin, honey-colored flakes (collarettes) among the eyelashes. Long-standing staphylococcal infection is associated with loss (madarosis), whitening (poliosis) and misdirection (trichiasis) of eyelashes. 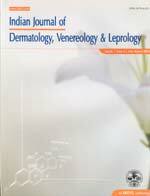 Madarosis has been reported as the most common ocular lesion (76%) in leprosy patients. The ocular involvement is higher in lepromatous leprosy followed by borderline and tuberculoid leprosy and shows increased incidence with the age of the patient and duration of the disease. Parasitic infestation of eyelids with the mite Demodex folliculorum commonly found in the pilosebaceous components of the eyelid can also result in the loss of eyelashes. Mites have been found to be more abundant in older persons, diabetics, and those with S. aureus infection of the eyelid. These are characterized by the presence of waxy, cylindrical cuffs (hypertrophic follicular epithelium) around the bases of the eyelashes. The mite consumes epithelial cells, produces follicular distention and hyperplasia and increases keratinization leading (in eyelashes) to cuffing, which consists of keratin and lipid moieties. Follicular inflammation produces edema and results in easier epilation of the eyelashes. It also affects cilia construction so that lashes become brittle and fall. b) Trauma from rubbing or plucking may be the cause of unilateral or bilateral lash loss. c) Allergy : The loss of lashes may be secondary to allergy to the use of eye cosmetics such as mascara. Waterproof ′mascaras′ are the most difficult to remove and can take too many lashes with them. Loss of eyebrows and eyelashes can occur in association with alopecia areata. Alhough loss of scalp hair is usually present, rarely madarosis may be the presenting sign. , Discoid lupus erythematosus (DLE) usually presents with lesions on the sun-exposed areas. , Periocular involvement occurs uncommonly and may progress from eyelid erythema to scarring and madarosis. However, madarosis may be the presenting sign of DLE in the absence of any history of preceding erythema and scarring and should therefore be considered in the differential diagnosis of chronic blepharitis that persists despite usual medical management and eyelid hygiene. Madarosis has also been reported to occur in systemic lupus erythematosus and scleroderma. Hair follicle activity is affected in pathologic states such as hypothyroidism or hyperthyroidism. , Changes of hair growth and hair structure may be the first clinical sign of a thyroid hormonal disturbance as a result of the influence on the cell cycle kinetics of the hair follicle cells. In hyperthyroidism, hair changes include thinning, breaking off, shortening of the hair and patchy areas of hair loss. Eyelash loss has been reported as an early sign in hyperthyroidism. In hypothyroidism, the hair may become dull, brittle and coarse, with reduced diameter and may involve the eyelashes and brows. Madarosis may also be associated with hypopituitarism and hypoparathyroidism. Idiosyncratic reaction resulting in unilateral madarosis and facial alopecia has been reported secondary to long-term use of Botulinum A injections for orofacial dystonia. Drugs such as miotics, anticoagulants, anticholesterol drugs, antithyroid drugs, boric acid, bromocriptine, propranolol, valproic acid and chronic epinephrine therapy have been reported to cause loss of eyelashes. , Ciliary madarosis has also been reported following cocaine use. Intoxication with arsenic, bismuth, thallium, gold, quinine, and vitamin A can also cause loss of eyelashes. This includes trichotillomania which refers to a rare form of hair/eyelash loss resulting from avulsion of hairs by the patient. It is characterized by compulsive pulling out of one′s hair associated with tension or an irresistible urge before pulling, followed by pleasure or relief. The hairs are broken at different levels, they may be tufted, tortuous and some hair fibers may be abnormally longer than others. The hair follicles may be prominent.